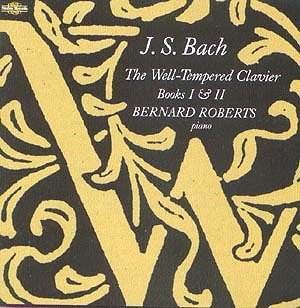 The Well-Tempered Clavier Books I & II. Buy through MusicWeb for £16.00 postage paid World-wide. This boxed set has a very readable, long essay by Wilfrid Mellers, who suspects/assumes that there may be theological reasons for Bach's title, 'being well-tempered makes us good tempered and possibly pleases God'! (A very different view is taken in the notes provided with Ralph Kirkpatrick's account on clavichord). Discussion is never ending about the right way to play them and what is the right instrument. Mellers reviews recordings on harpsichord and piano by 'maverick geniuses' like Wanda Landowska, Rosalyn Tureck and Glenn Gould, and contrasts their famous performances with modern pianists like Bernard Roberts 'of exceptional intelligence and imagination - - with a familiarity with restored or remodelled clavichords, harpsichords, baroque organs and early fortepianos' who can embrace the virtues of baroque instrments 'in subtly rewarding equivocations'. The Preludes, which I came to know long before grappling with the fugues, are wide ranging and embrace dance forms, toccatas and ornamented pieces like operatic arias. I have enjoyed the experiment of programming a group of them for CD listening apart from their fugues, which are also discussed and characterised by Mellers in his invariably provocative and enlightening manner. Armed with his commentary and the scores, these CDs offer hours of rewarding listening, best taken, I suggest, about half a CD at a time, to prevent the mind from wandering. In that fashion, they have been my holiday morning listening for a week. The performances are scrupulous in detail, with judicious minimal rubato and careful variety of touch and articulation to ensure lucidity and maintain expressivity above all. The recorded sound, from the Nimbus Concert Hall (July to October 1998) is exemplary. There are of course many choices, and I have reviewed the Archiv reissue of Book 1 on clavichord by [Ralph Kirkpatrick DG 463 601-2] which would go well as a companion for this set. The other recent contender, highly praised (I have not heard it) is by Angela Hewitt for Hyperion, replacing their recently deleted clavichord version of all 48 (96) by Colin Tilney. Swings and roundabouts in the world of CD marketing!